Marjorie Rogers represents businesses, tax-exempt organizations and individuals in the areas of federal taxation, estate planning and administration, including probate litigation, employee benefits and ERISA. 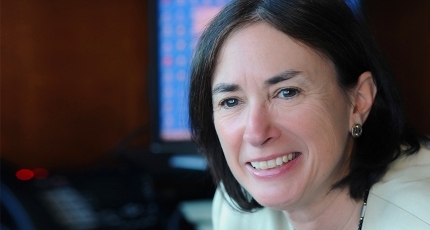 She has more than thirty-five years’ experience advising clients on their complex tax issues, wills, trusts, family succession plans, retirement plans, and business entity planning. Marjorie listens to her clients to determine their individual goals and helps clients achieve them with a plan that they understand and with which they are comfortable. While she has experience in drafting complex estate planning documents such as intentionally defective trusts, charitable remainder trusts, charitable lead trusts, qualified domestic trusts, insurance trusts and family limited liability companies, she does not believe each situation necessarily warrants these types of trusts. Marjorie works with each client to develop an individual plan to meet the client’s needs. Most of her clients have been with her for many years and refer family and friends. In addition to her practice, Marjorie is active in community and professional non-profit organizations. For more than fifteen years she has been involved with and is a Past Chair of the Board of Directors of WESST, a statewide small business incubator that helps low-income women and minorities achieve financial self-sufficiency through sustained self-employment. Marjorie is a Fellow in the American College of Trust and Estate Counsel (ACTEC) and is a member of that organization’s Charitable Organizations and Employee Benefits Committees as well as the State Chair for New Mexico. 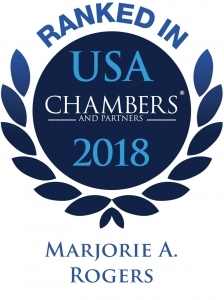 Recognized by Chambers USA as being “well respected for her work on trusts and federal tax,” Marjorie provides expert advice to both private and nonprofit organizations pertaining to IRS audits and company liquidation, among other areas. Her expertise also includes trusts and succession planning. She has also achieved the AV® rating from Martindale-Hubbell, the highest rating possible. 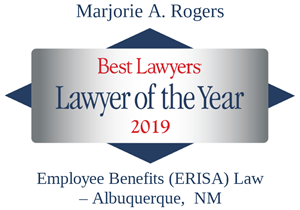 She has received recognition from Best Lawyers of America® for more than 10 years, and was selected as Employee Benefits (ERISA) Law “Lawyer of the Year” in 2015 and 2019, and selected in 2013 as Tax Law “Lawyer of the Year” in Albuquerque. She is among those listed in Southwest Super Lawyers® and was honored as a Woman of Influence in 2011 by New Mexico Business Weekly. Marjorie serves as Chair of the firm’s Tax, Probate and Business practice and Chair of the Nonprofit/Tax-Exempt Organizations industry group. Before joining Modrall Sperling, Marjorie worked with the Chief Counsel’s Office of the Internal Revenue Service in Washington, D.C. and on the Tax Counsel Staff of General Motors Corporation in Detroit, Michigan. Represented husband’s estate in a three year litigation battle with the estranged wife of the decedent. The judge awarded the estranged wife a fraction of the amount she sought. Represented clients in transferring closely held businesses to family members using tax efficient vehicles such as family limited liability companies and intentionally defective trusts. Advised clients with sizeable IRAs on conversion of traditional IRAs to Roth IRAs. By converting traditional IRAs into Roth IRAs, the clients were able to reduce the size of their estates by using non-retirement assets to pay income taxes currently. Additionally, should the clients continue to live long lives, they will no longer be required to take required minimum distributions. Assisted clients in investing retirement assets in non-publicly traded investments. Designed a reorganization plan and obtained a private letter ruling to confirm compliance with IRS regulations to assist the founding-family shareholders of corporation in reducing federal taxes. The shareholders, after paying their share of taxes from the entities’ income, receive increased after-tax distributions from the corporation. Advised a number of public charities in updating their investment policies and endowment agreements to maximize the increased spending flexibility now allowed under the Uniform Prudent Management of Institutional Funds Act. Advised a number of public charities in the area of fiscal sponsorships. A fiscal sponsorship is an arrangement between a public charity and a third person that is not a public charity but is engaged in a charitable activity that meets the public charity’s tax-exempt mission. The advantage to a donor is the charitable deduction for the contribution. The advantage to the third person is being able to obtain funds to carry out the charitable project. The advantage to the charity is the receipt of administrative revenue in the carrying out of its mission. Assisted public charities in utilizing the rebuttable presumption safe harbor allowed under Treasury Regulation Section 1.4958 concerning executive compensation for “disqualified persons” (i.e., executive directors, presidents, etc.). Which is Better for Business Owners: Compensation or Dividends? Marjorie has given numerous presentations at professional meetings including the annual convention of the State Bar of New Mexico, the New Mexico Certified Public Accountants, the New Mexico Estate Planning Council, the Santa Fe Estate Planning Council, the Institute of Continuing Legal Education in Ann Arbor, Michigan, and the Association for Continuing Legal Education (ACLEA).